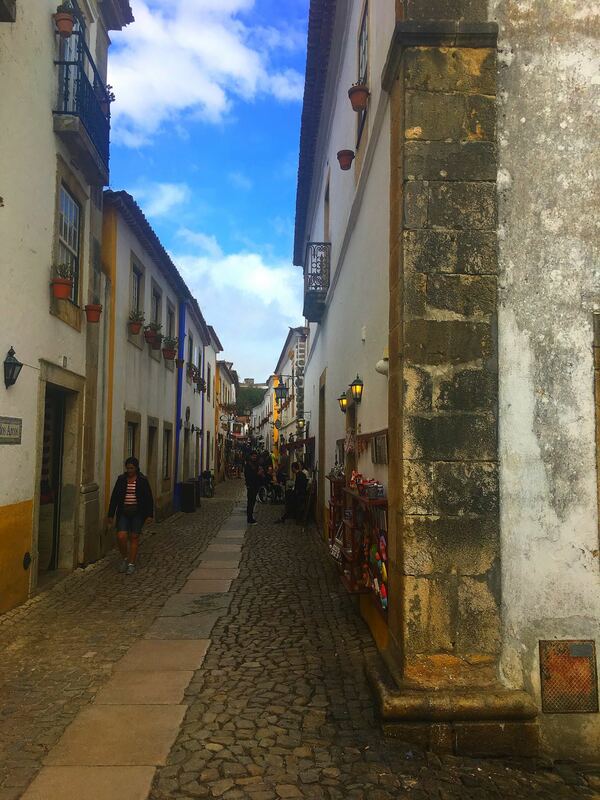 Obidos is a traditional Portuguese town on the West Coast of Portugal. 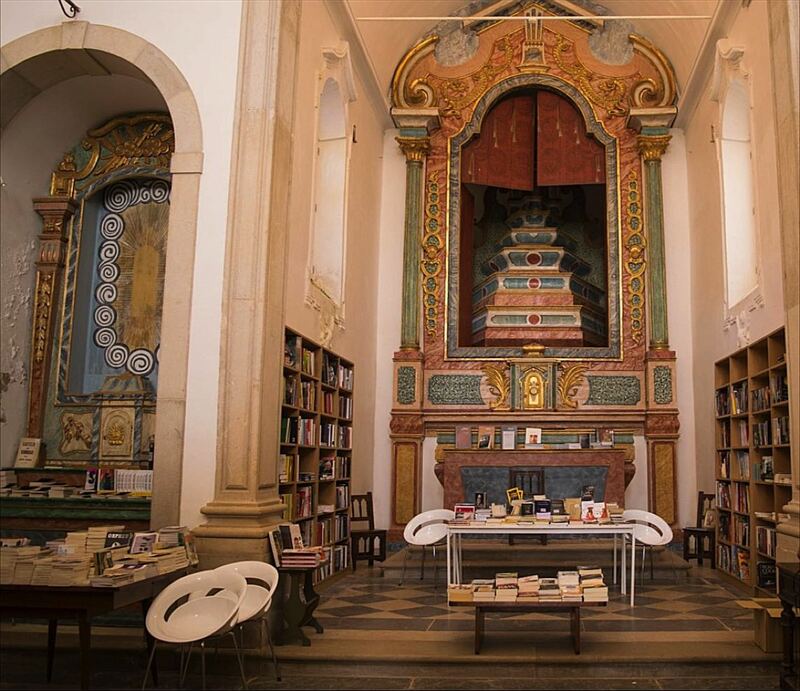 It’s only an hour’s drive from Lisbon which makes it a place worth visiting for a day trip. 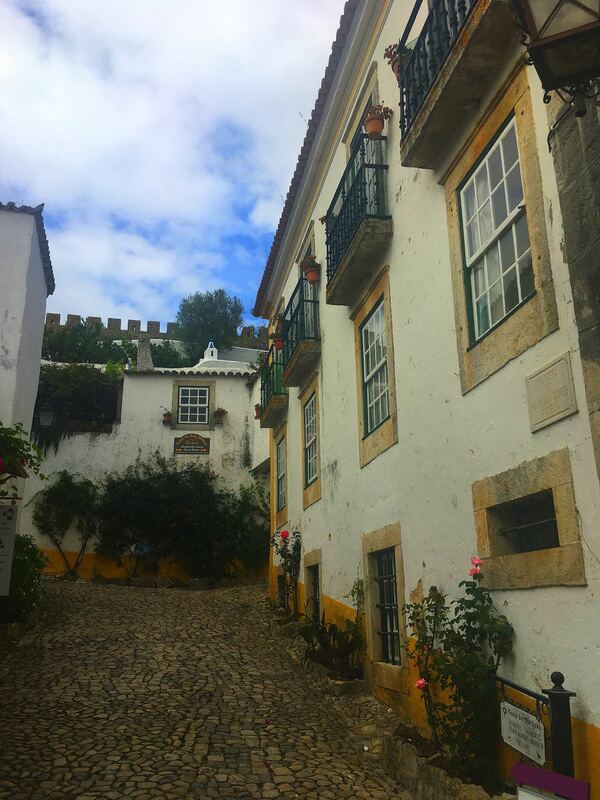 It’s a beautifully preserved old town with a hilltop castle all contained within the medieval walls of the city. Cars cannot be driven through the old town although we did find one or two that came in. (Maybe they were residents or hotel guests). It certainly made it more pleasant to walk around without the traffic. The car park just outside the gate charges by the hour and the large one just across the road is free. Just across the road and a little further on from the car park, by the aqueduct is a free stellplatze (motorhome overnight parking). From the car park outside the walls, we walked up to the main southern gate into the town which contains a beautiful Baroque chapel. 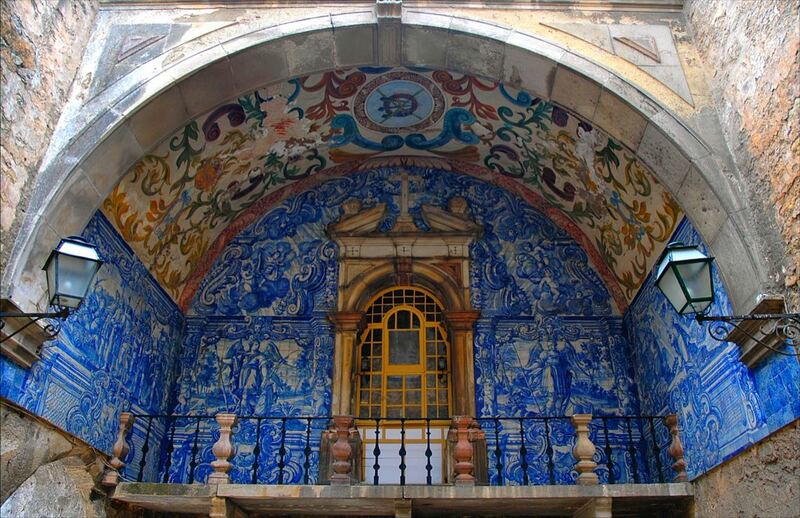 The blue and white 18th century glazed tiles, called Azulejo, depict the passion of Christ while the ceiling represents the crown of thorns. 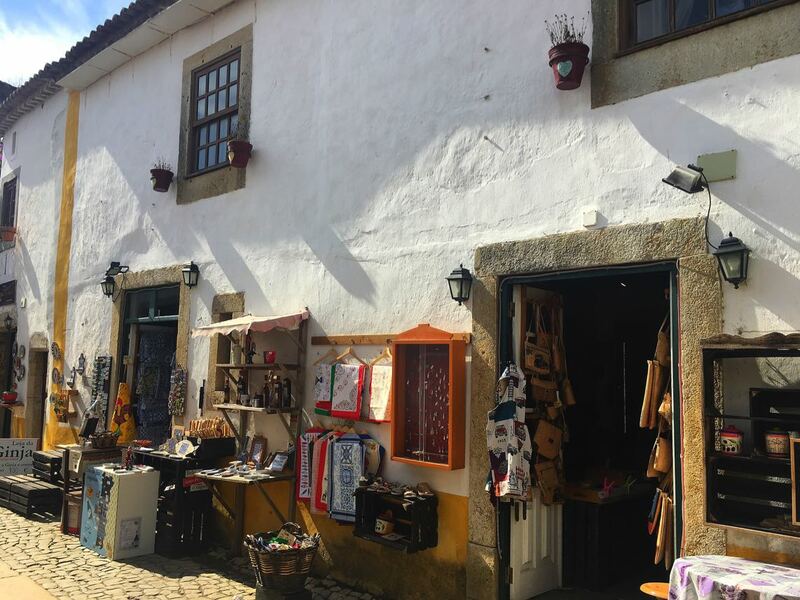 The story here is that Bernardo de Palma, a magistrate based in India, funded these works after his daughter is claimed to have died from a broken heart due to unrequited love for a man from Obidos. 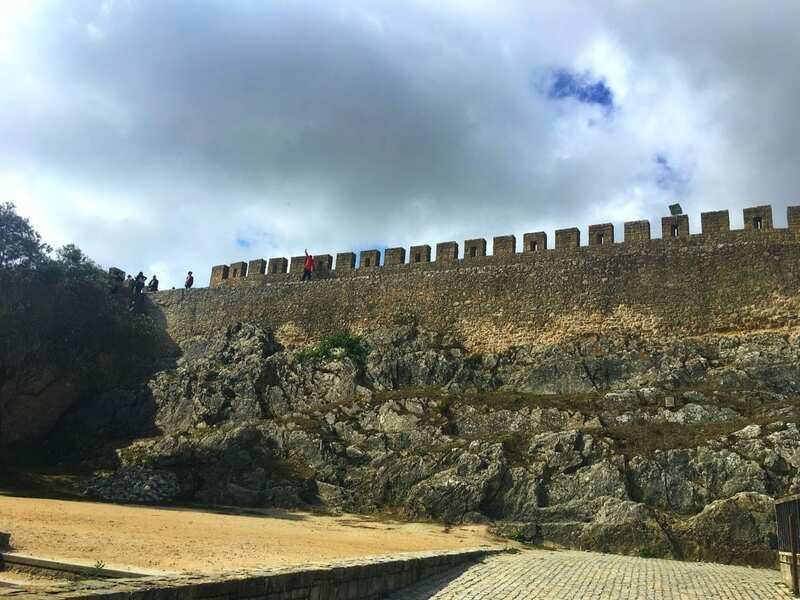 The Porta da Vila passes through two low-rise entrances that were staggered to prevent a direct charge and low enough to inhibit mounted attackers following the conventional design of late gothic Portuguese castles. 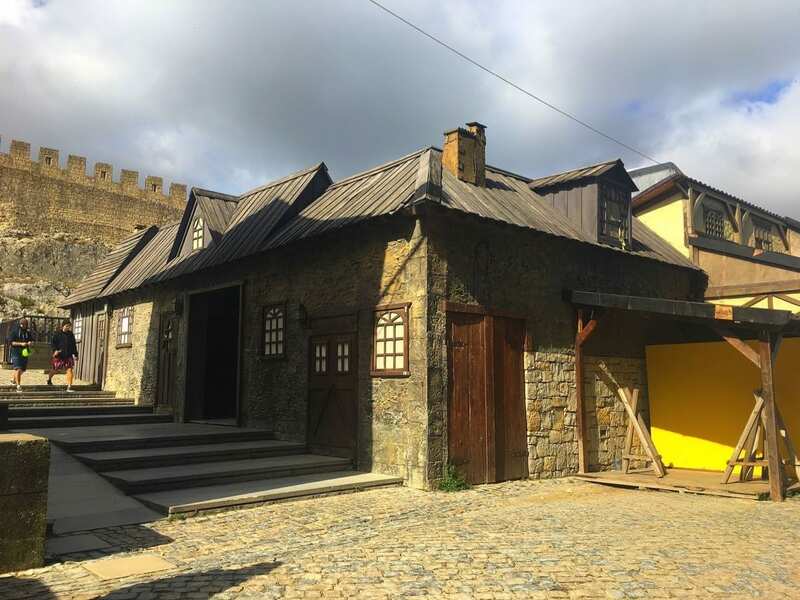 Once we passed through the main gate, we followed the long narrow cobblestone road through the town. I particularly loved the beautiful, yet humble whitewashed cottages that are trimmed with vivid yellow and blue borders. The low arched doorways and stone ledges created the feeling that they had been there for centuries. 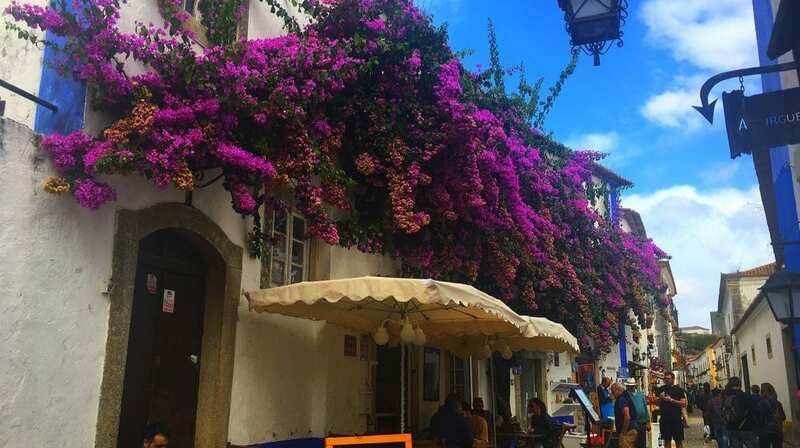 Geraniums and bougainvillaeas were creeping up the sides of the cottages and made it look so very picturesque. Other homes had colourful window boxes outside. Or pots lining the steep steps beside some of the houses. Yes, it’s touristy with the many souvenir shops, restaurants and small cafes but they honestly blend in with the town and make it appealing to walk around. 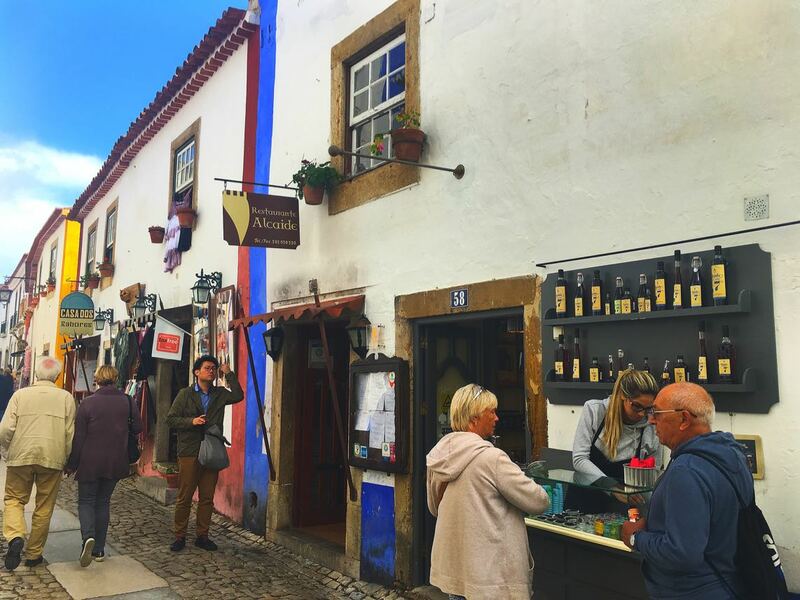 There are plenty of places to sample the local cherry liqueur called Ginia de Obidos on the stalls outside the shops. It was something we were looking forward to trying. The best bit is that after you have drunk a shot of this lovely sweet tasting drink, you get to eat the edible chocolate cup. I must say the two flavours go together perfectly. The cost is a very reasonable 1 euro each. You can get this cherry liqueur from other places in the region, but Obidos grow the cherries and make it in the town. It’s, understandably, a popular town with the tourists, and you get a lot of coach tours visiting. In the summer months, it can get crowded. If you make your own way there, it is advisable to visit earlier or later in the day when the coaches have gone. We were lucky visiting in late October, so it wasn’t too crowded at all. We noticed many bookshops here, and there was even a bookshop in St James Church. 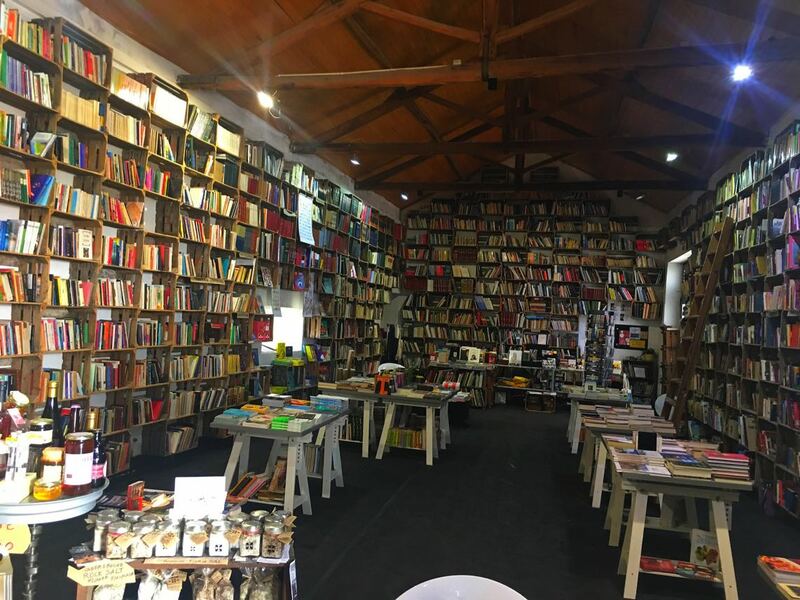 I have since read that Obidos earned recognition by UNESCO as a creative city of Literature in 2015, in coordination with the town’s first international Literary festival. 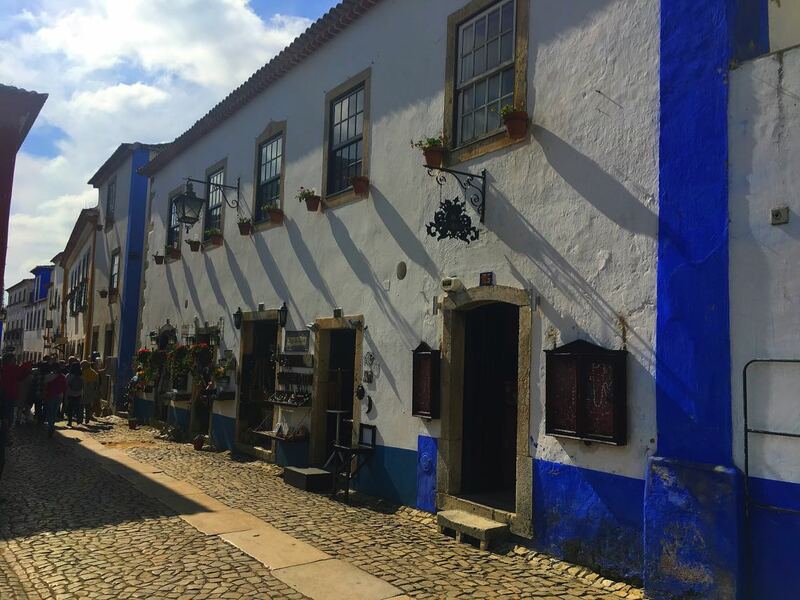 Obidos is home to over 3000 people, and if you deviate from the main street to the outer lanes, you come across the modest homes of the locals. We enjoyed exploring this quiet area where the paint is a little more faded on the houses, and you’ll find washing hanging from the lines outside the windows. It’s nice just walking along and imagining what life would be like living there. Back on the main street again we walked up to the imposing castle. The 12th-century castle has been converted into a luxurious hotel although from the outside you would never know. Obviously, you can’t go inside unless you have booked a room. You can, however, walk through the grand arched gateway into the gardens. The inner courtyard is impressive with recreated buildings which are used for markets and festivals. This area is free unless there is a festival on in which case there will be a fee to enter. Although we didn’t go inside it looks fantastic from the outside and what a unique location for a night’s stay? I can imagine that it would be costly to stay the night. The castle was founded by the Moors as early as the 700s. It was then reworked in the 1200s, and its interior was gradually made more habitable for the succession of queens who lived there. 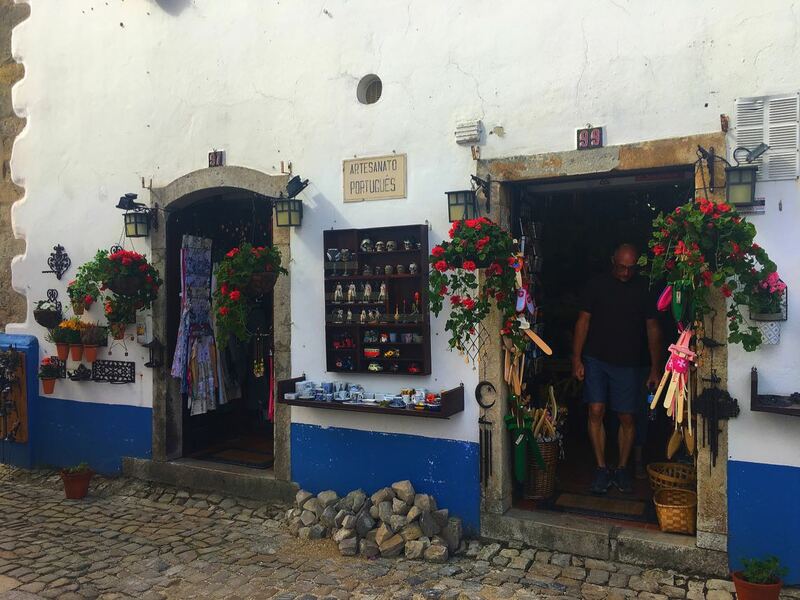 History tells us that Obidos was the traditional bridal gift of the Kings of Portugal to their queens. 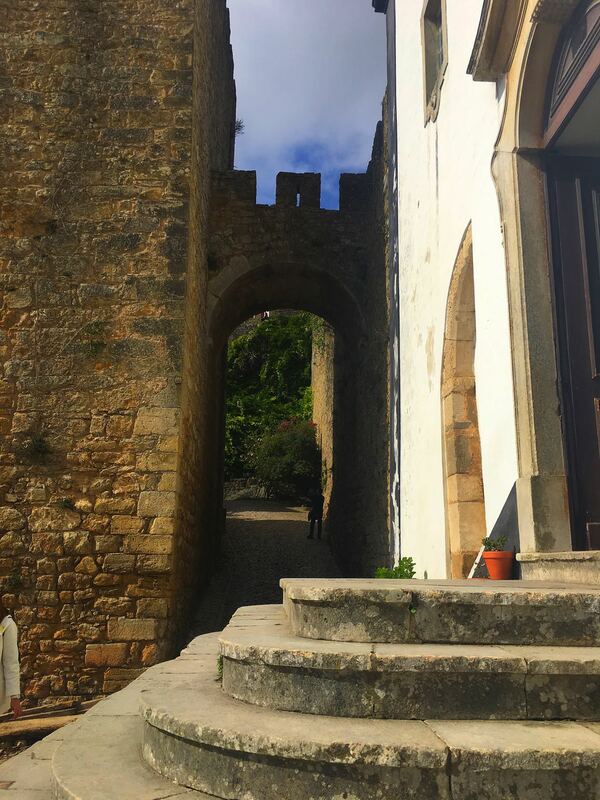 The only way to really appreciate Obidos is by climbing the well-preserved city walls. 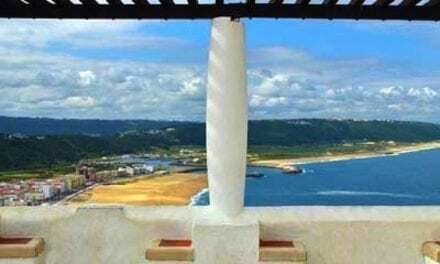 The walls are a popular feature with visitors because of the beautiful views. 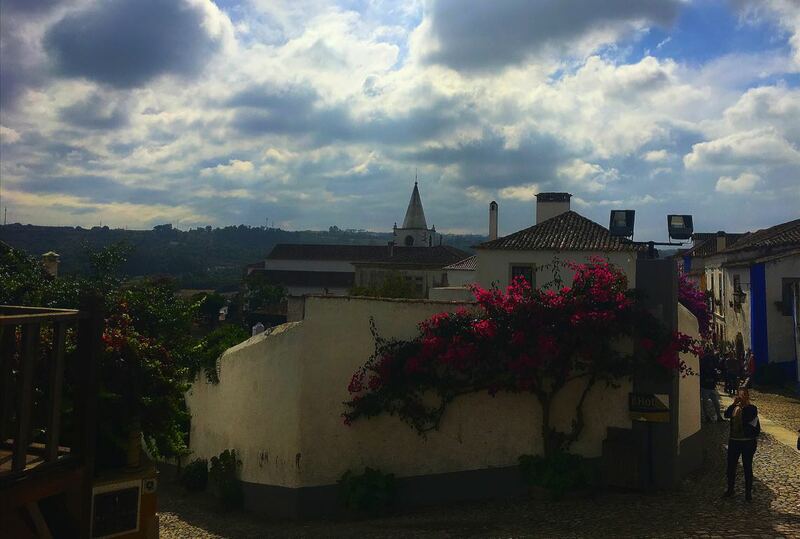 You can see over the tiled roofs and traditionally painted houses to the surrounding countryside of windmills and vineyards. The city walls date from the 14th century when they were strengthened. The walk around the walls takes about an hour, and the full circuit is about 1.5k. Stairs leading up onto the walls are found beside most gates. 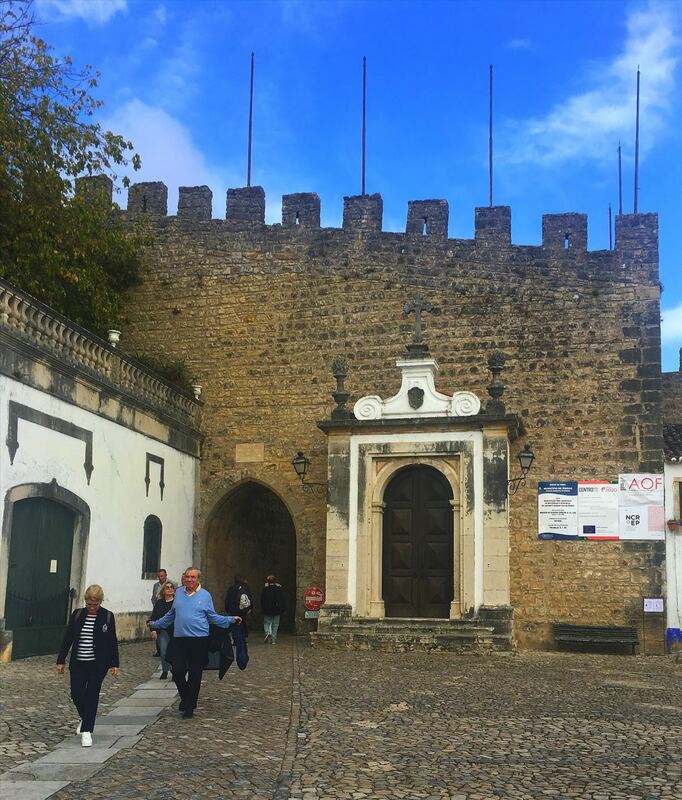 The walls are open into the early evening so if you are staying overnight in Obidos walking the walls early morning or late afternoon is a much better idea as they are narrow in places which makes it difficult passing other people in some areas. Walking along the walls was not something we fancied doing especially once we noticed that there are no railings or barriers to hold on to. With a sheer drop on the inside, rough, uneven stones and lots of trip hazards we thought it could be a bit dangerous and would not be suitable for someone with balance issues. 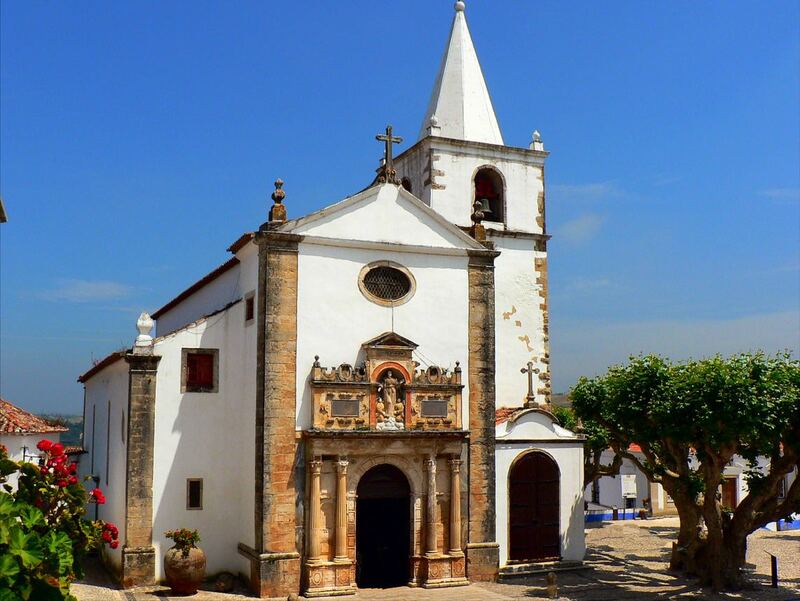 Igreja de Santa Maria church is in the main square. Due to the earthquake in the 1500s, there isn’t much left of this medieval building although it has had work done on it a few times. Much of the interior walls are clad with tiles dating back to the 1600s and 1700s. 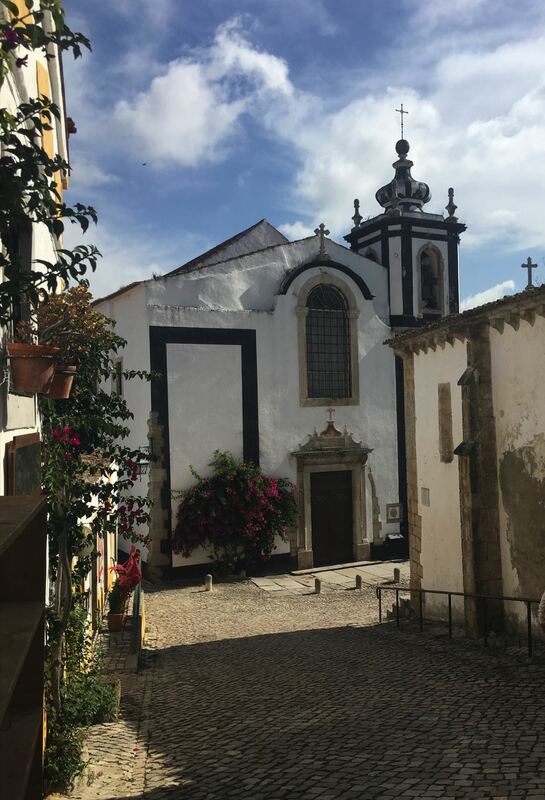 This church was the setting for the wedding of King Afonso V to his cousin, Princess Isabella of Coimbra, on 15 August 1441, when they were both still children aged nine and ten respectively. In front of the church is the Pillory, a monument to the town’s autonomy and a place where criminals were punished. 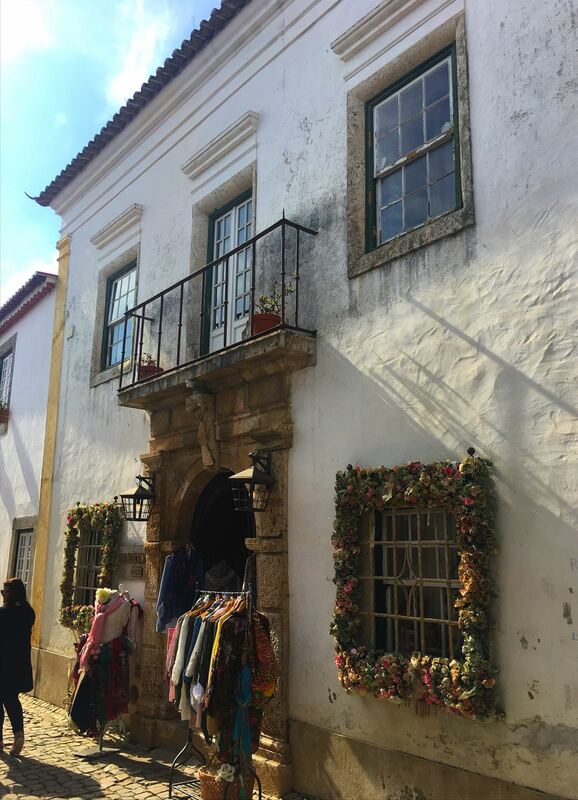 The Telheiro is a building that housed the town’s indoor market until the 1900s. Every year the castle grounds and public squares are taken over by several major events. 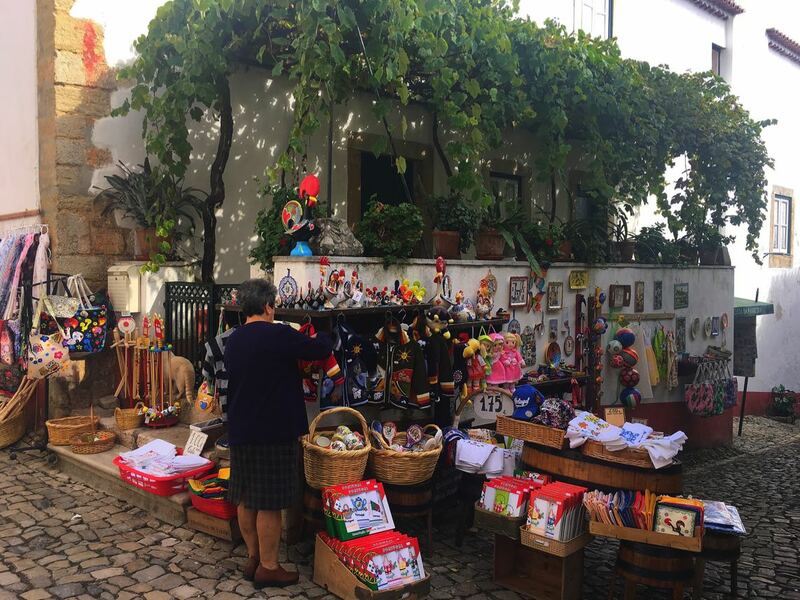 A Medieval Festival, A Chocolate Festival and a Christmas Market (vila Natal). 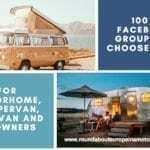 This festival runs over a weekend in April. Check dates on the internet. Each year there is a different theme. The 2018 programme of events included chocolate tastings. Chocolate and sweets workshops and lectures. A chocolate sculpture exhibition. A fashion show of garments made from chocolate. The kids could make chocolate pizzas plus live entertainment. From 30th November until around 6th January. (check the dates on the internet). 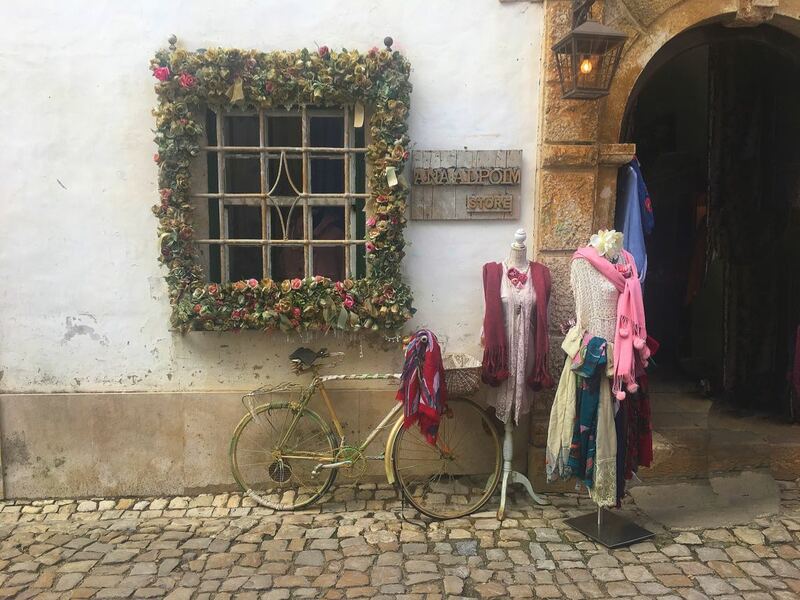 In December the town of Obidos is covered with lights and celebrates Christmas with a lineup that includes a Santa’s Village and a merry-go-round for youngsters, an ice rink, display of Nativity scenes, Christmas tales and street entertainment. 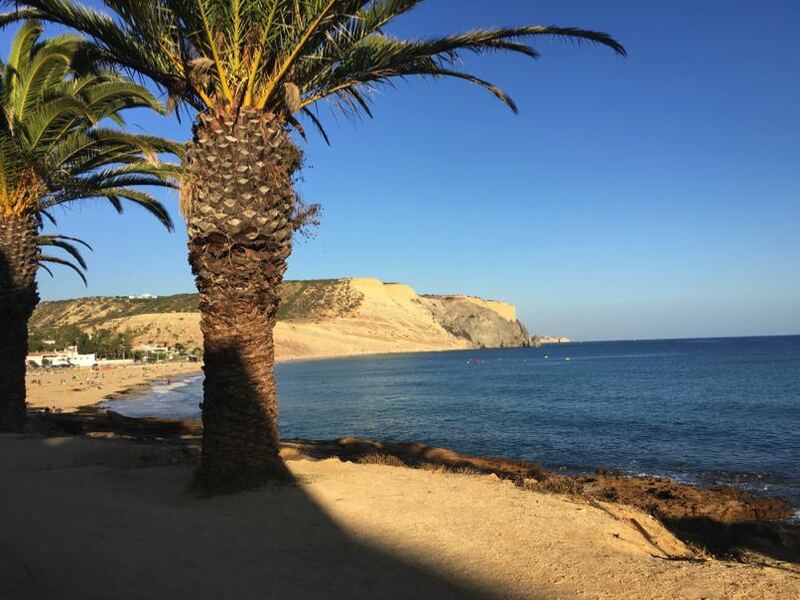 A popular beach with families is the lagoon-side beach at Foz do Arelho. The water in the lagoon is calm and slightly warmer than the sea. In the summer months, it is patrolled by lifeguards. On the other side of the beach, you have the powerful Atlantic ocean waves which makes it quite windy but good for surfing. 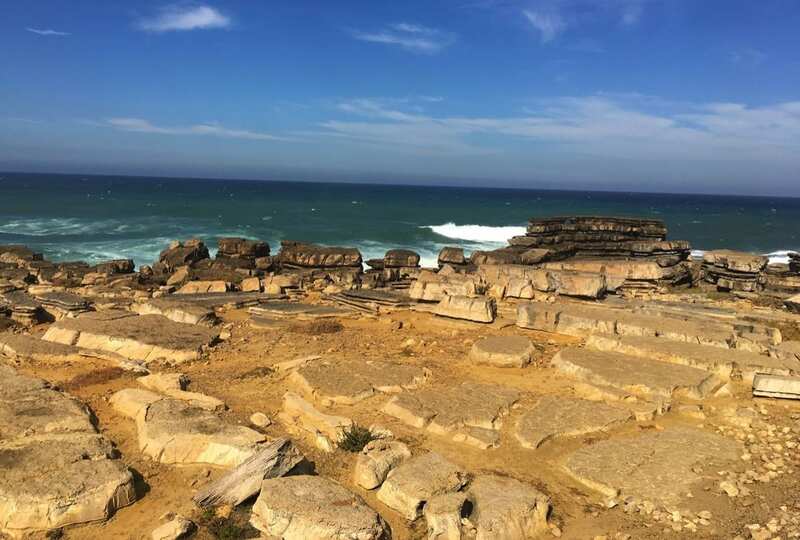 Baleal beach, near Peniche, is excellent. We particularly liked the unusual rock formations. 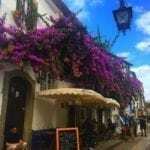 Although you could get around Obidos in a couple of hours, it is lovely to be there when the crowds have gone home. Also, the whole atmosphere of the place changes at night. One of the advantages of motorhoming is being able to stay so close (just outside the gates on the stellplatze) and walk in and out as we please. 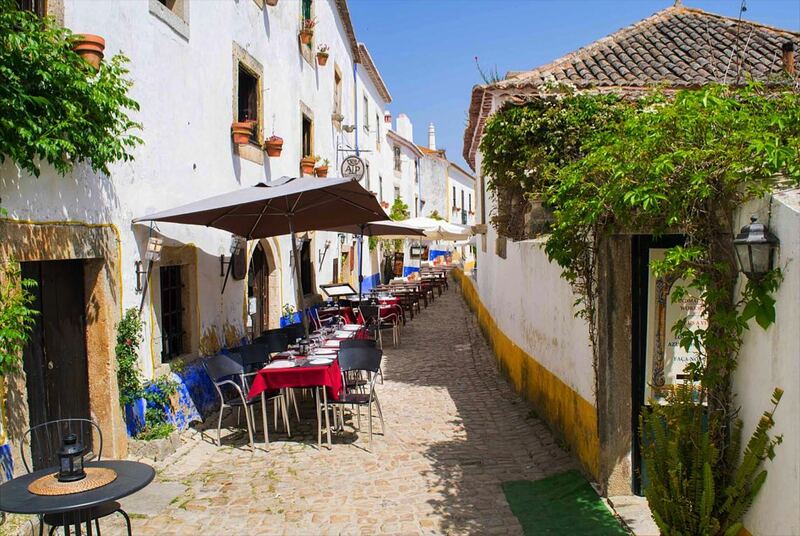 However, if you haven’t got a motorhome, there are plenty of accommodation options in and around Obidos. 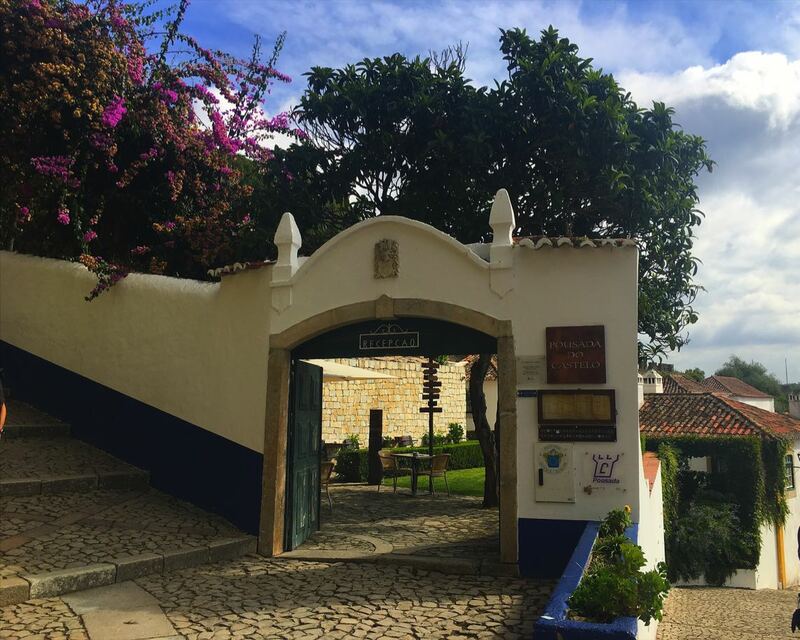 If you are staying in Obidos, then it’s worth exploring beyond the walls as well. There are some charming streets, restaurants and hotels outside as well as the aqueduct and abandoned remains of a windmill to see. 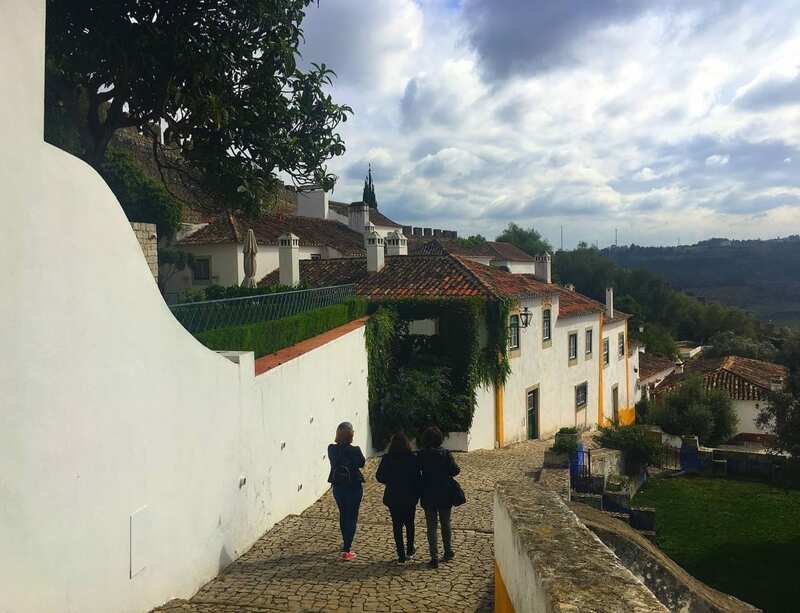 There are walking trails leading running along the western side of Obidos. 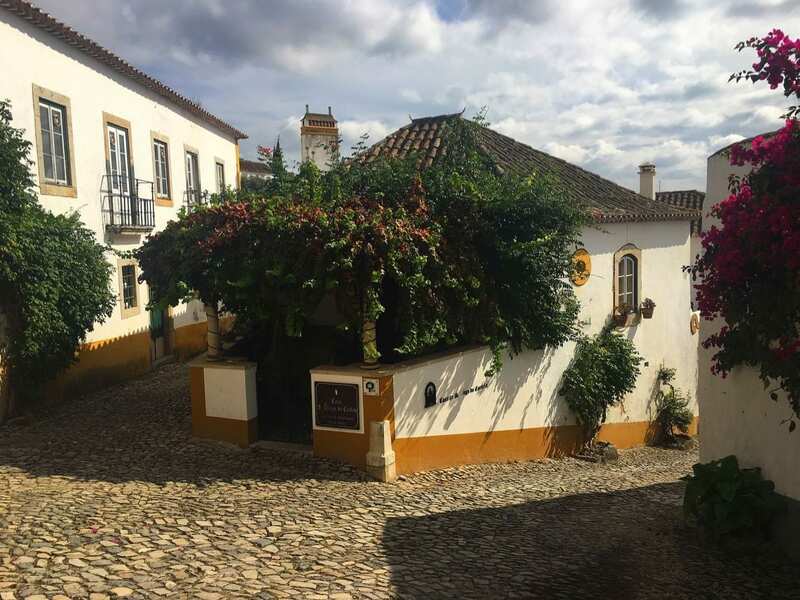 The Casa d’Obidos built in 1889 can be found 1km south of the town walls. It has beautiful gardens and an air of faded grandeur. 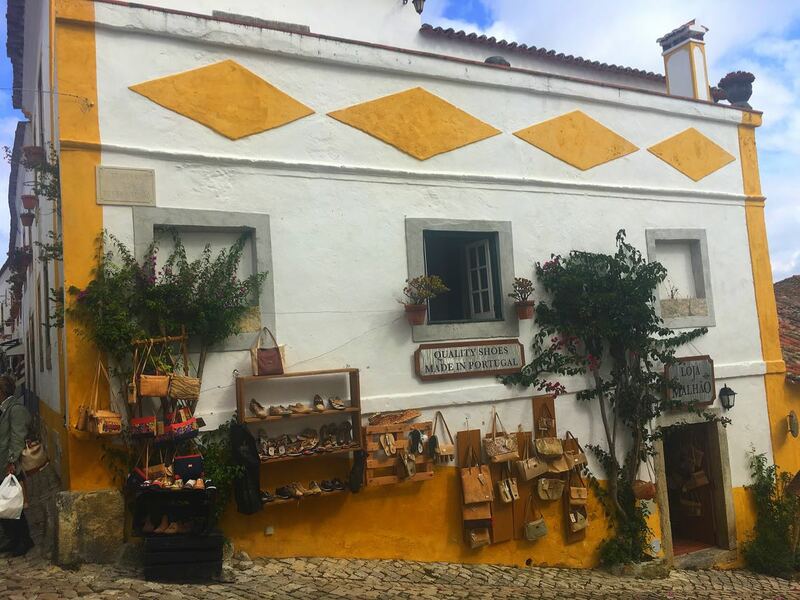 is 12km south of Obidos and has a unique collection of Buddha statues which include terracotta statues, pagodas and numerous statues of Buddha, all set in the grounds of a winery. The entrance fee is 3 euros. 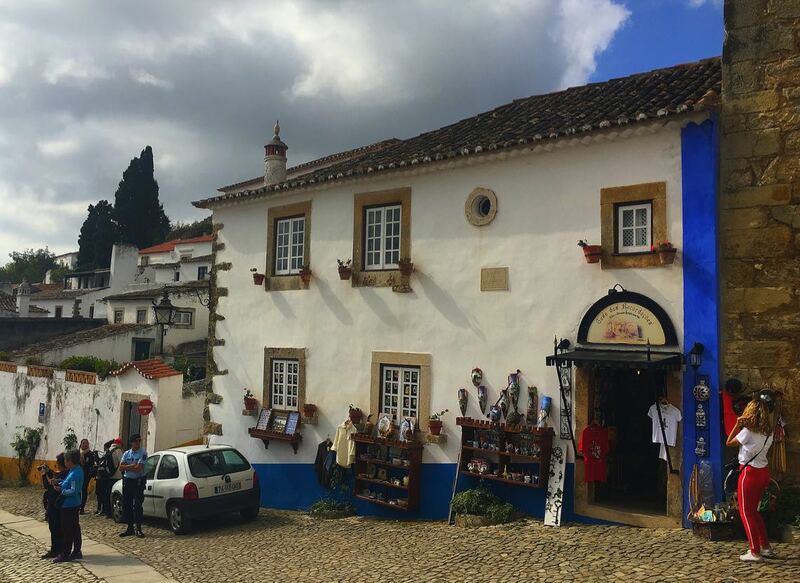 The tourist information office is just outside the Porta da Vila entrance, near the bus stop. The staff are accommodating and are multilingual. We picked up some brochures and maps from there. 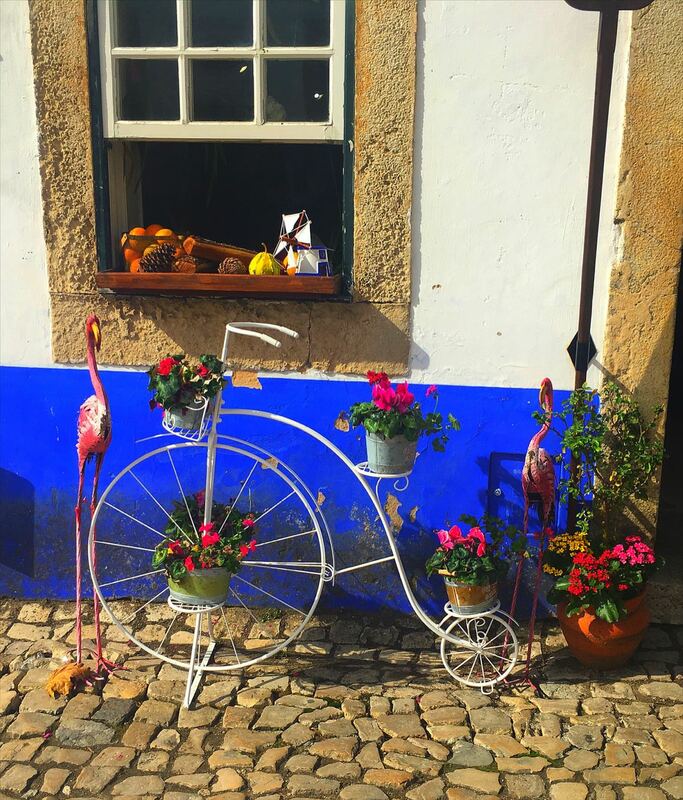 Porto to Obidos take the A1 and A8. Journey time is2 hours and 14 minutes. 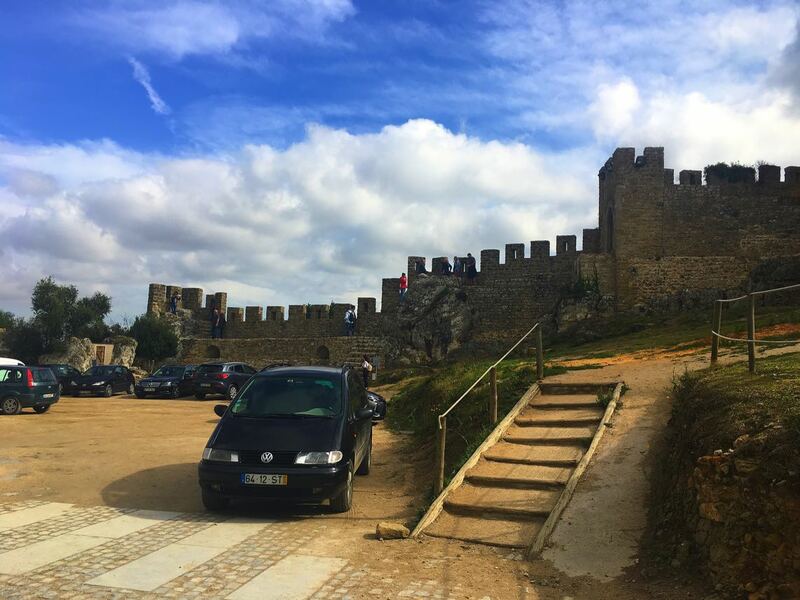 Lisbon to Obidos take the A8. Journey time is one hour. 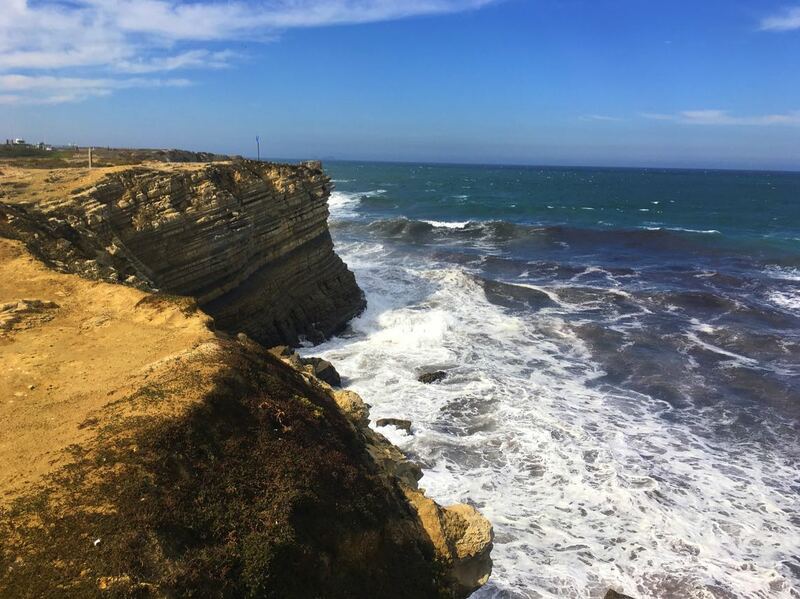 There is a direct express bus service called “Rapida Verde”, (green express) which runs between Lisbon and Obidos. The Rodotejo bus company operates this route. The journey takes an hour, and there are ten daily departures Monday to Friday but less at the weekend. The timetable can be downloaded from their website. Tickets can be purchased from the bus driver. A single ticket is approximately 8 euros. 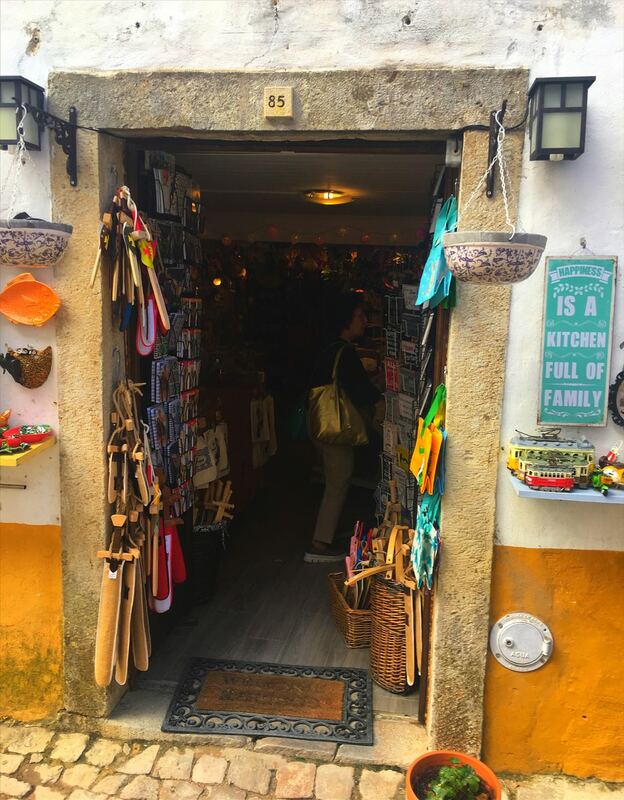 You can only buy a single ticket and not a return, which is something we have found a lot on the West Coast of Portugal. The bus departs from the Campo Grande bus station in Lisbon. 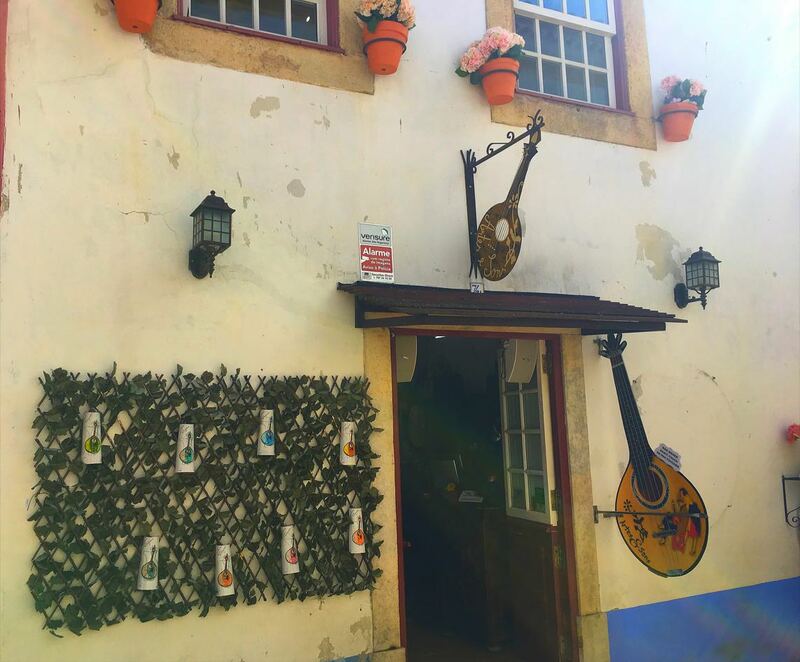 The final stop of the Rapida Verde route is the town of Caldas da Rainha so look out for that on the front of the bus. The bus stand should have the Rapida Verde timetable on it. 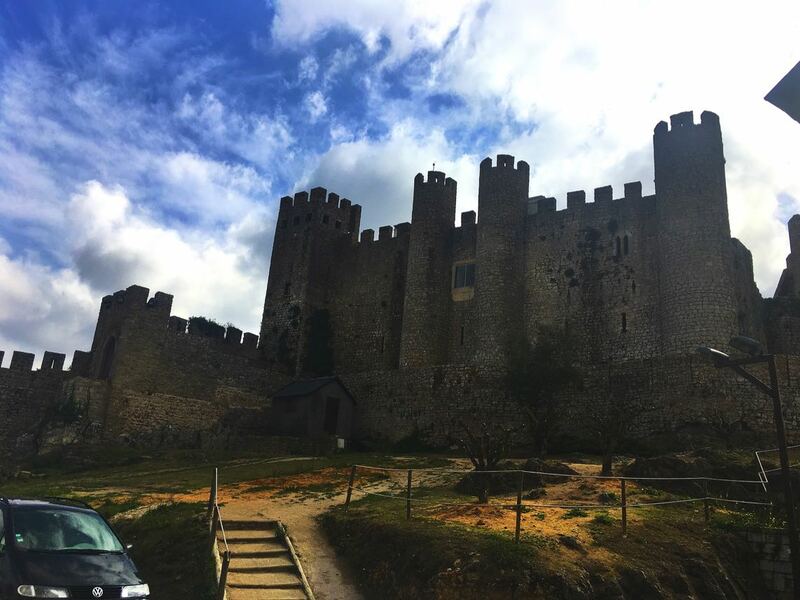 The bus goes along the A8 motorway and has only one other stop on the way to Obidos at a town called Bomarral. Buses stop on the main road just outside Porta da Vila. You can also get a bus from here to Peniche which is 40 minutes by bus. 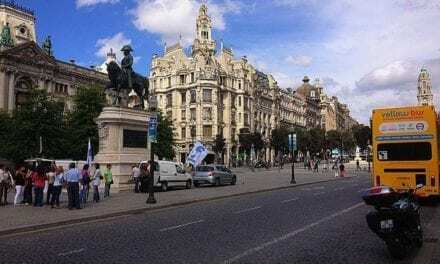 The buses to Lisbon are hourly on weekdays. 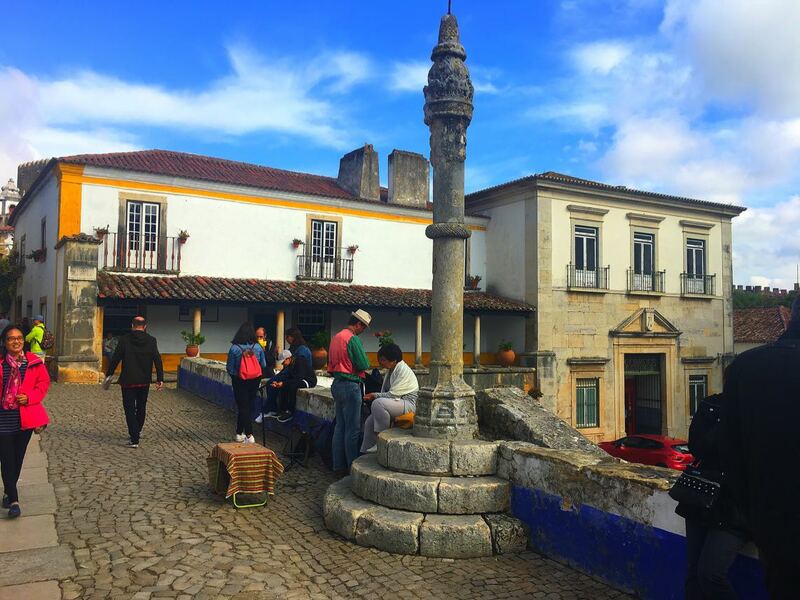 Although there is a train station close to Obidos the town is served by regional services, which means that all trains are very slow. 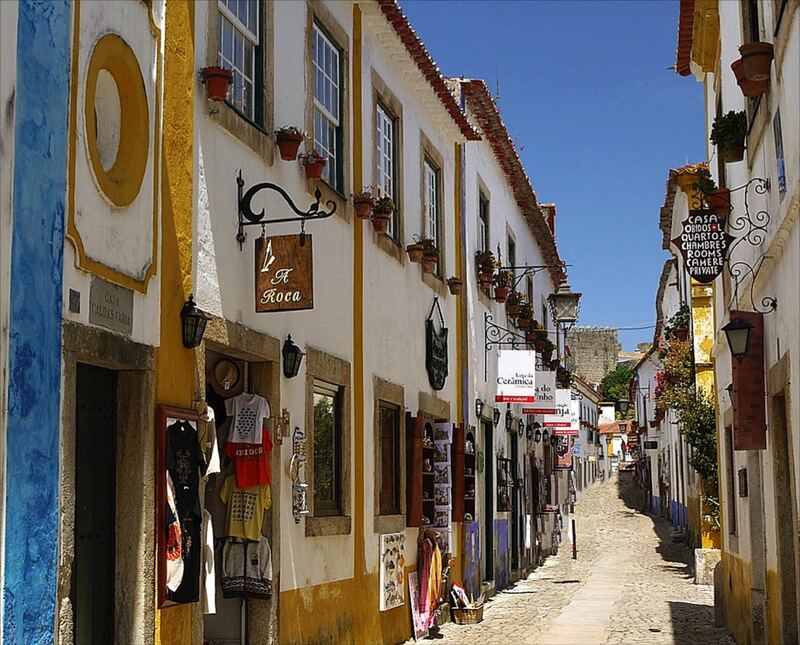 The infrequent direct train service from Lisbon to Obidos takes two hours, while the express bus takes just over an hour. 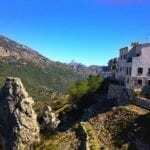 Organised tours have the advantage of knowledgeable guides and remove the hassle of public transport. 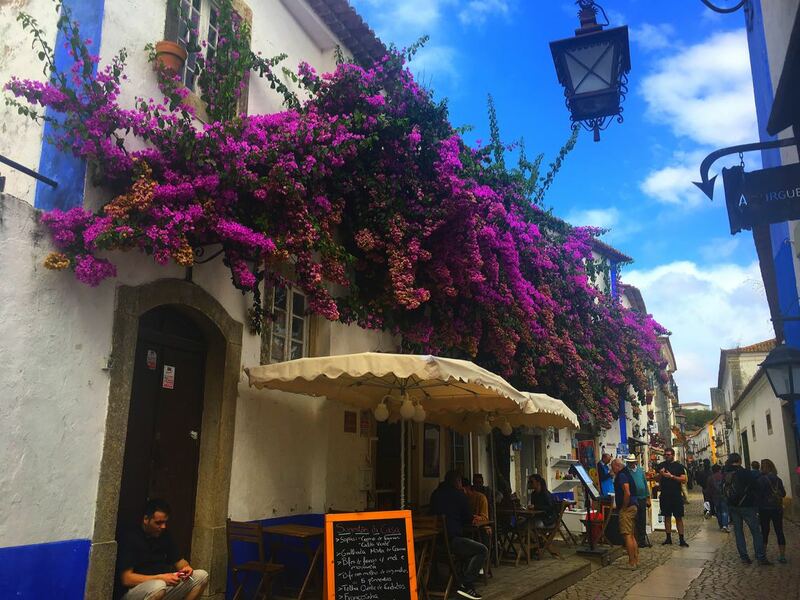 There are several tours from Lisbon that include a couple of hours in Obidos (which is plenty of time) as well as a whirlwind tour of nearby towns and sights.